On arrival at HoueiSay in Laos from Chiangkhong (Thailand), we embark on our traditional boat for cruising downstream on the Mekong River. This portion of the Mekong River is not too large but both banks of the rivers are bordered by very beautiful mountain ranges and green forest. The pace is very relaxed, a perfect way to observe rural life close up. Along the way, we stop over at Ban Houeilampen to visit the Hmong hill tripe people. They are very poor, but have an interesting culture and a colorful history, overnight in Pakbeng. Early morning upon leaving Pakbeng, we visit the hill tribe market; we then begin our expedition, venturing into northern Laos mountain remote area. The roads conditions are good enough to explore; however the verdant and rugged mountain scenery combined with the colorful local population makes for an unforgettable experience. Today, we drive through the area, home to various ethnic minority groups including the Hmong, Khmu, Akha and Taidam. The journey leads us through the scenic area to Nong Khiow. Here is a chance to visit Hmong at Ban Jarong, Ban Songja, Khmu hill tribe people before reach Nong Khiow by late afternoon. Overnight in Nong Khiow. Breakfast, we board a traditional boat down stream on Nam Ou River, leisurely on peaceful river and visit some timeless villages starting from Nong Khiow. Along the way we stop to visit some weaving village of Khmu. 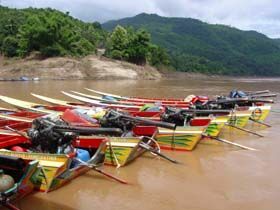 We then continue our journey down to the mount of Pak Ou, where Nam Ou River meets with Mekong River. There, we visit mysterious caves of Pak Ou, which are crammed with thousands of gold lacquered Buddha statues of various sizes. We continue our trip down to Luang Prabang. This former royal capital with its gleaming temple roofs, fading colonial architecture and stunning mountain backdrop retains a unique charm rarely found in all Asia. UNESCO recognized in 1985 as World Heritage Cultural City, perhaps it’s the best preserved traditional city in South East Asia”. There is little traffic on Luang Prabang roads and monks in orange robes scurry in all directions carrying umbrellas to shade themselves from the Sun. Observing sunset by the mount of Phousi. From there, we explore Street Night Market, where you can find the lovely collection and handmade textile by local and hill tribe people surrounding Luang Prabang. Overnight in Luang Prabang. An early morning breakfast and departure to Vang Vieng. The journey is strenuous as we drive along one of the most scenic but rough routes in the whole of Asia. We arrive in Vang Vieng, a small town which is located on a bend in the Nam Song River. This tranquil town is rapidly developed with the advent of tourist, but the beautiful scenery with a mixture of quiet water and limestone outcrops is unchanged for century. We visit Tham Hoy Cave and surrounding village of Khmu and Hmong hill tribe minorities, where we call another home to colorful ethnic minorities. Overnight in Vang Vieng. Breakfast, we drive ahead to the capital city of Laos is Vientiane which is located on the banks of the Mekong River. This small town conjures up exotic images, with the curious mix of Lao, Thai, Chinese, Vietnamese, French influences. After a half day traveling by winding roads, we arrive in Vientiane and start our city tour [if time permits]. We visit Wat Sisaket, the oldest temple still standing in Vientiane. This amazing structure features remarkable frescoes and Buddha images. The following sight is Haw Prakeo, the former royal temple of Laos monarchy, where previously housed the famous Emerald Buddha Statue. We then visit the imposing Patuxai Monument which is well known as Vientiane’s own Arc de Triumph before continuing to the famous That Luang Stupa. Over night in Vientiane. Early morning, we are heading out to southern Lao capital, driving on the 13th south, experience the flatland to central Laos and turn to road no.8, which is the trading route and also become one of the famous Ho Chi Minh Trail. On the way, we visit local villages, enjoying the great scenery limestone mountain along the road, overview the peaceful landscape on Nam Theun River. Arriving at Laksao, just before Laos – Vietnam border gates, upon arrival, we are strolling around to this little town and experience local market. Overnight in Lakxao. Early morning, we transfer you to the border between Laos and Vietnam.